"I've tried other services, but yours is consistantly up-to-date where others are not." 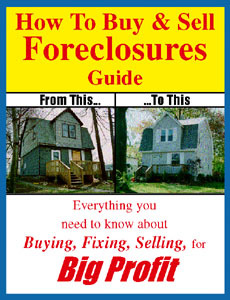 The How to Buy & Sell Foreclosures Guide teaches you everything you've always wanted to know about buying, renovating and selling foreclosure homes. You'll learn everything from "How to find the right property for you" to "How to save money on closing fees." This book is co-written by Craig Laube and Joyce Aponte who are among the most well respected pioneers in the foreclosure industry. The "Guide" promises to answer every question you have (and some you may not even have thought of) about foreclosure homes, properties, bank, government and VA foreclosure listings. Pre-foreclosure records filed in New Jersey updated daily. Pre-foreclosure records filed in Philadelphia, PA updated weekly.